More often than not, couples tell me that they’re awkward, or have never been in front of the camera before, or are super nervous about the shoot because “what if I don’t know what to do with my hands? !” And I totally get it. If you put me in front of the camera, I freeze. “WHAT DO I DO WITH MY HANDS? !” - me. But that is a huge part of my job as a wedding photographer. Although shoots may seem like a bunch of manufactured moments, the emotions are real and the love shared between the two people in these photographs is authentic. Olivia and Kody were seriously so easy to work with, and not to mention, just genuinely awesome people to spend an evening with. 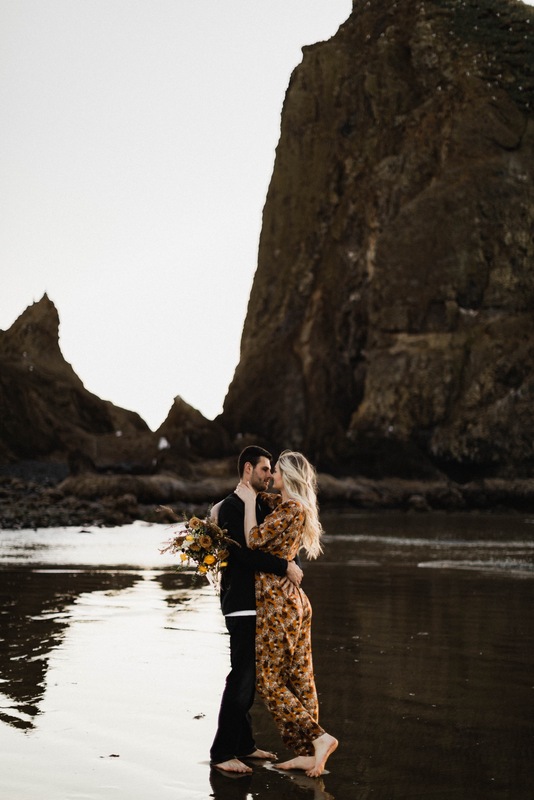 I actually connected with Olivia originally when setting up a styled shoot in Astoria, Oregon which she designed the most gorgeous bouquet for. Be sure to check out her work! So when we talked about this shoot, I knew I’d get to photograph another beautiful bouquet and you all know how I feel about bouquets. This shoot of course had to be in Cannon Beach because I have been pretty much obsessed with the Oregon Coast the entire year and this particular day was the first in a long time that I caught a real glimpse of spring. The water was freezing but the sun was warm and that’s really all you can ask for in a Pacific Northwest beach. But seriously, look how warm and sunny this day looked! And of course how cute this couple looked. There’s no doubt that these two are each other’s best friend. Chelsea Moudry is a traveling wedding & elopement photographer based in Portland, Oregon.